Colour block – a trend that comes and goes across the interiors world but with the abundance of strong products on the current market, it’s definitely sticking around for now, is proving popular and is an easy look to achieve and evolve with homewares through the changing season – refreshing with different cushions, throws or artwork. Plus it’s also easy to update with a fresh coat of paint on a single wall. It’s about picking a few strong colours that sit well together and emphasising with accessories in the same tone. For example -A bright yellow wall, a green sofa with green cushions and then dashes of orange in the curtains or rug. Keep patterns to a minimum and break up with lots of white and wood to ensure the few colours stand out strong and bold. This trend is really aided by the great selection of bold coloured modern silhouette sofas currently filling high street homeware stores. Head to Made, John Lewis or Ikea for a range of affordable options. There are great options in the perfect colours of the year – emerald greens, mustards and deep rich blues. Love them or loath them, pinapples are this years choice of fruit…again! Seemingly beating of the likes of the cherry, banana and watermelon, this year we will continue to see pinapples on soft furnishings, wallpapers and in the form of accessories. Bring some fun summer vibes to a room with bright wall art or printed cushion or keep it sophisticated with a tonal wallpaper. Show your love of pineapples with accessories, like lighting, kitchenware or bookends, anything goes and there is a huge array to pick from. With new colour trends appearing all the time its hard to keep up. Decorating whole rooms to the latest shades is not always an option, so instead it’s a great time to start introducing accessories and accents. A big colour choice for now, going into next year is Red. Not an easy one to work with, so our advice is to keep it simple. 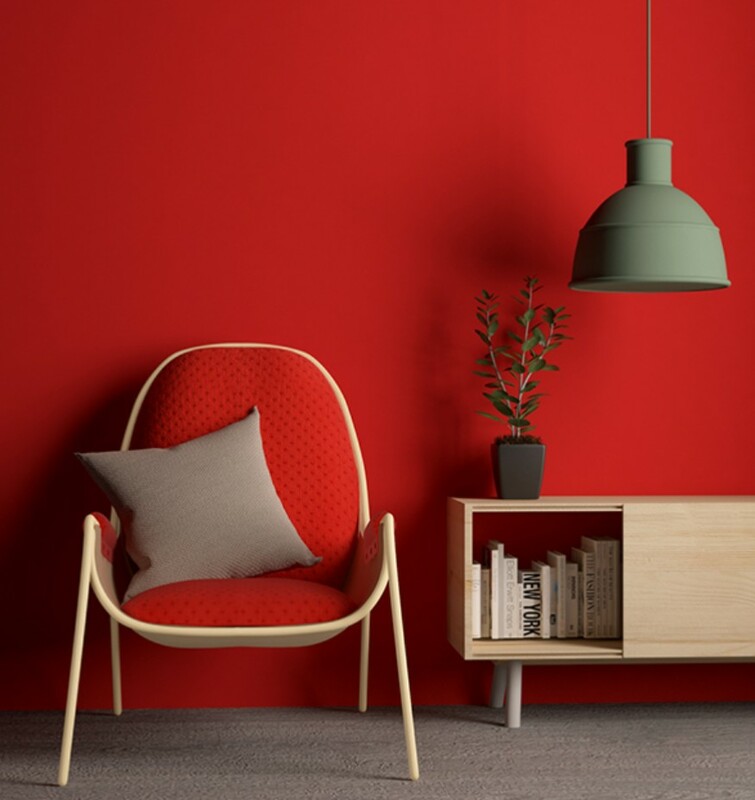 Red is a colour that is going to shout out within a room, so make sure the pieces you choose enhance the space, not clutter it. A statement clock or cabinet will draw attention in a room, as well as an armchair or sofa. Perhaps opt for a painted wall, a chalky matt finish will tone the effect down and in turn will create a more subtle finish. A monochrome, white walled room is going to act as the best back drop to red accessories, but an industrial look also looks great with red light fittings or tiles, ideal in a kitchen. Whatever your thoughts on the colour Red there is no doubting it’s uplifting and fun. We are on board! As we head towards Autumn blankets and throws become more and more of a must have. We have found these gorgeous examples from Anthropologie, all with on-trend tassels, embroidery and pattern. We have come to see quite a lot of paint dipped items for the home over the last year or two. But this trend seems to be staying and where it has been really popular on furniture; chair and stool legs aswell as ceramics and vases, the big look carrying on through Summer into Autumn is dipped baskets. We have some tutorials below for you to follow. A very simple way to freshen up a room and bring a new feel to a space is by using soft furnishings, especially cushions. This can also be an inexpensive way of updating a sofa or chair by changing existing covers. This Summer the big trend is graphic print, and statement imagery. A good place to start is hm.com which has some gorgeous digital and geometric cushions cover from only £3.99. The colour pallete is quite muted with blues, greens and grey. 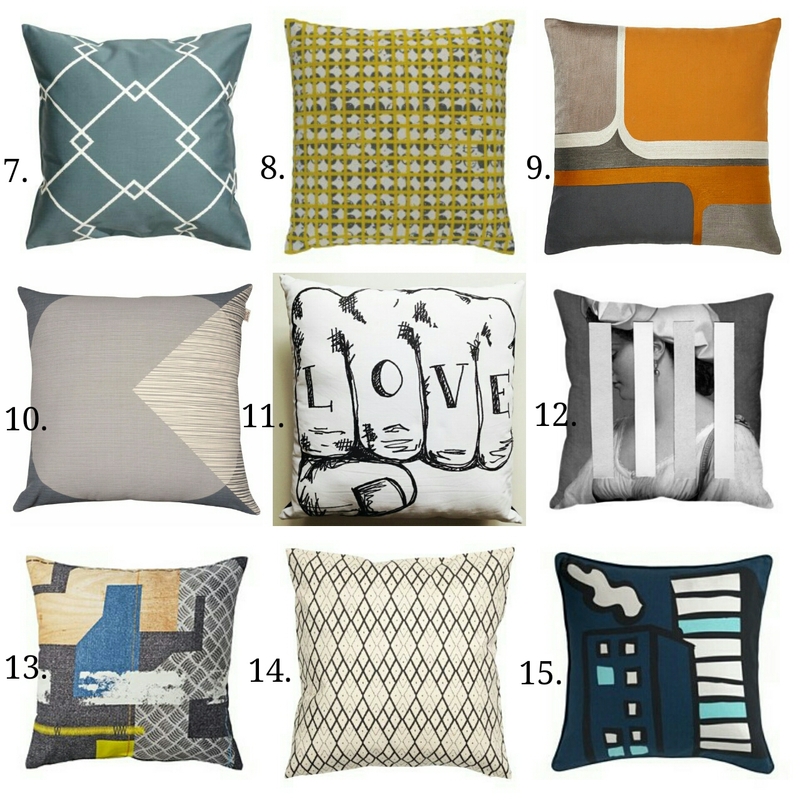 One or two of these designs mixed with some plain cushions works really well. Be more adventurous by clashing geometric with strong imagery like the camera design cushion from violetandpercy.com. Have some fun when picking cushions, pick one or two illustrated or cartoon options for individual chairs. For a cohesive look in a room try and match colours tonally with the the rest of the room. Maybe pick out a colour you have on a wall or with a rug you already have. Alternatively mix up the colours and prints and go wild. This summer the tropical emphasis is less on foliage and plants and more on fruit and strong graphic pattern. Vibrant fruit is key for this trend: watermelon, pineapple and strawberries create playful imagery and pattern within soft furnishings and wall art. There is almost a childlike feel, with cartoon style illustration and candy colours. There is no need to go over the top with this trend as you can pick selected pieces to achieve the look. Choose a bold framed print for the wall or a couple of bright patterned cushions to jazz up a sofa or chair [ hm.com has some great choices this season ]. Alternatively pick some fruit inspired ornaments in brass or gold to bring interest and fun to a shelf or table. The pineapple has been the most popular this year so far, in the form of lighting bases, storage jars, candles and vases to name a few. Oliver Bonas even stocks a gold jewellery stand in the shape of a pineapple! Accent colours to think about are light tones of pink, blue, yellow and peach, and the best wall colour has to be a neutral backdrop of white. The great thing about this trend is that it easily transfers into the garden with lots of outdoor eating items such as cups, plates, napkins and table cloths available [ head to H&M and Tiger ]. So it’s simple, think desert island, exotic fruits and tropical birds and whatever the weather you will have a little bit of paradise in your home.